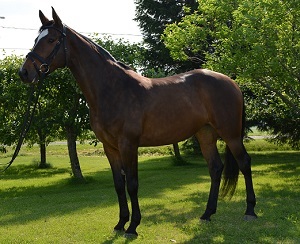 Flashy 2010 dark bay Holsteiner mare (registered RPSI) by Royal Appearance, microchipped and has her national canadian passport. Was bought as a foal in USA and trained by Professional eventing rider up to 6yo. She did some basic eventing classes with only successes (red and blue ribbons) as an honest 4-5yo. She is in full training with a Professional dressage rider now. Competed last year in Training Level with red and blue ribbons. Super mover - judges love her! This mare will succeed in the discipline of your choice as she is very versatile. No vices. Farrier and vet (vaccinations, Coggins, deworming and teeth) up-to-date. Used to load at least once a month with or without a ramp or other horses. Perfectly sound -No health issues known. Price will increase with training. Also, excellent prospect for any breeding program - very good bloodlines!